Claim your Branson Discount Coupons & Vacation Guide! Our friends at TakeMe2Branson.com offer money saving Branson Vacation Packages, which combine lodging, dining and entertainment during your Branson vacation. If you and your family would like to learn more about the fun activities, charm and relaxation that Branson has to offer, then check out the Official Branson Vacation Guide, published by the Branson/Lakes Area Chamber of Commerce & CVB. This full color, 155 page booklet is sure to provide some great ideas and money-saving coupons. Flipping through the pages of the Branson Vacation Guide is sure to inspire pre-vacation excitement for you and your travel companions! 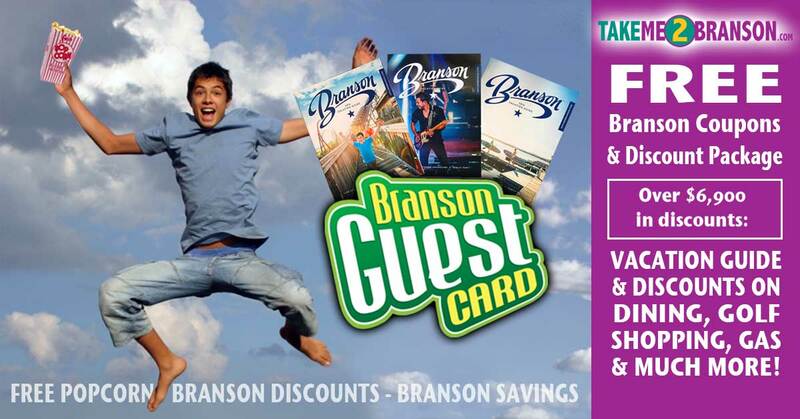 The Official Branson Guest Card is packed full with over $6,900 in savings discounts. The suggested retail price is $39.95, but we would like to present our visitors with a complimentary Card, Savings Book and Vacation Package magazine. Just click the link below and submit your order. No credit card needed, because it’s YOUR GIFT… courtesy of TakeMe2Branson.